On the 31st of January 2008, I will be heading to the Antarctic as part of the Australian Governments Antarctic arts fellowship. It is an 8 week roundtrip aboard the ship the Aurora Australis, visiting 3 of the Australian bases on one of the annual re-supply trips. During the voyage I will be drawing like a madman between bouts of seasickness, and will be putting some of the work I make and interviews with people on the boat, up on a specially built website. Some schools in Victoria (Australia) will be following my journey, sending me questions and making artwork of their own back in the classroom. Each week, new content will be uploaded, with the first actual week onboard ship, to be put online around about the 8th of Feb. Currently there are things about before the voyage (new drawings are going up all this week as I make them). The site should be pretty easy to get about, but for the less savvy, below I have written out a quick guide to the site, where things are etc. 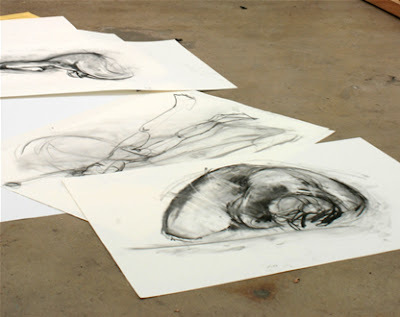 Last year I asked the Drawing research network members for some thoughts on the project. I am very grateful for all the ideas that I received, it gave me a good base from which to start from. William Kentridge born 1955 Sleeper is an etching produced by the intaglio process in an edition of fifty. It was made at 107 Workshop, near Bath, and published by David Krut, London, during a visit Kentridge made to England. The recumbent naked male figure depicted is very similar to one which appears in a slightly earlier etching, titled Act IV scene 7, from Kentridge's portfolio of eight etchings called Ubu Tells the Truth 1996-7. It is also thematically related to drawings made for his film Ubu Tells the Truth in 1997 (Tate T07481), which was produced in 1997. Kentridge mainly makes short animated films created typically from several large drawings, on which he draws and erases the developments of his narrative. Frequently the films are shown accompanied by the drawings which have gone into their making, providing frozen moments in the history of the film. In his film Ubu Tells the Truth he mixed other media, such as footage from documentaries, photographic stills and moving puppets, with his drawings for the first time. Sleeper, likefurther series of etchings Kentridge went on to make in the late 1990s, crystallizes some of the major issues of his work. One of Kentridge's fundamental themes is the desire to forget, or to remain oblivious to, difficult and unpleasant aspects of reality and history. More specifically, his films depict the struggle of the white South African psyche with its conscience over the exploitation and abuse of the African land and people, during the period in which the system of apartheid was first challenged and then dismantled. Characters in his films are locked into a state of denial in which preoccupation with personal relationships (such as love affairs) provides a means to ignore the increasingly loud and insistent calls for political change. Sleeping, in Kentridge's work, is a metaphor for a state of blissful ignorance, a return to the internal world of the imagination, which conveniently allows the external world to be forgotten. However, the sleeper must always wake up, at some point, andthis moment of awakening and recognition is continually approached in Kentridge's films. It is usually an experience of painful but fertile self-knowlege, in which various types of loss bring the films' Western protagonists to an increased connection to their African landscape and heritage and to their own humanity. Space to Draw is a curated exhibition of works from a mixture of emerging and established artists with a previous relationship with Jerwood: Antony Gormley, Neville Gabie, Peter Randall-Page, Michael Shaw, Heather Deedman, Alison Gill and Paul McDevitt. Most of these artists are known for their sculpture or site-specific work and drawing is an essential part of their practice. Space to Draw is the first in a series of conversations across the Jerwood Visual Arts disciplines. The Jerwood Visual Arts series encompasses sculpture, painting, drawing, photography, applied arts, and moving image in a regular series of awards, prizes, and exhibitions. Jerwood Visual Arts is involved in the questioning of the shifting and undefined lines between these disciplines. We have been busy arranging our first exhibition to take place at the drawing school over the Easter holidays. It is a group showing a diverse range of drawing and we hope it will be inspirational to our students and the general public alike. 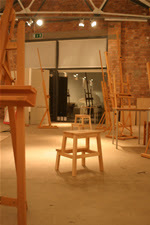 Keep checking our website http://www.drawingschool.org.uk/ for further information. We were lucky enough to be involved in the Graffle event, http://www.graffle.co.uk/, this weekend, a charity raffle of graffiti artwork from the likes of Banksy, Nick Walker and David Shrigley. By all accounts it was a huge success with all money going to the Bristol childrens hospital and Fairbridge West, and another event is rumoured for the summer. To kick-start 2008, Bristol will be lucky enough to be host to two of the most magnificent exhibitions of contemporary drawing in the country. The Royal West of England Academy in Clifton will be showing the acclaimed Jerwood Drawing Prize alongside Drawing Breath, a collection of drawings by the award winners and eminent selectors of this annual drawing prize. Comprising of over 180 works these exhibitions present the breadth and depth of contemporary drawing from a wide range of internationally and nationally renowned artists currently working in the UK. This past week saw us open our doors to the first students. The first class was Valerie's on the monday morning and after spending a long weekend adding the final touches to the school, easels, blinds etc... it was a relief to finally see people turn up and enjoy themselves. I think the class is great, and I was quite disappointed when we stopped at 12.30.